When the debate dust clears and all the pundits have gone home, preparation for the next gauntlet begins. It's the morning-after spin. Donald Trump's running mate, Gov. Mike Pence, made the morning show rounds on Tuesday, defending the Republican nominee's less-than-impressive performance (some wonder if it went so badly that he'll skip out on future debates, Politico reported). On ABC's Good Morning America, Pence said that Trump did a fantastic job during the debate, and talked a lot about how he supposedly projected his leadership capabilities. “They see in Trump the kind of leadership and kind of candor we need to turn this country around,” Pence said. Later, he added that Trump "took command of the stage, and I think the American people saw his leadership qualities"
But if by "taking command," Pence was referring to the multiple times Trump interrupted and spoke over Hillary Clinton, then I’m not quite sure how he can equate that with great leadership skills. These actions made Trump look as much like a successful leader as interrupting moderator Lester Holt repeatedly to tell him how great his presidential temperament is made him look self-aware. 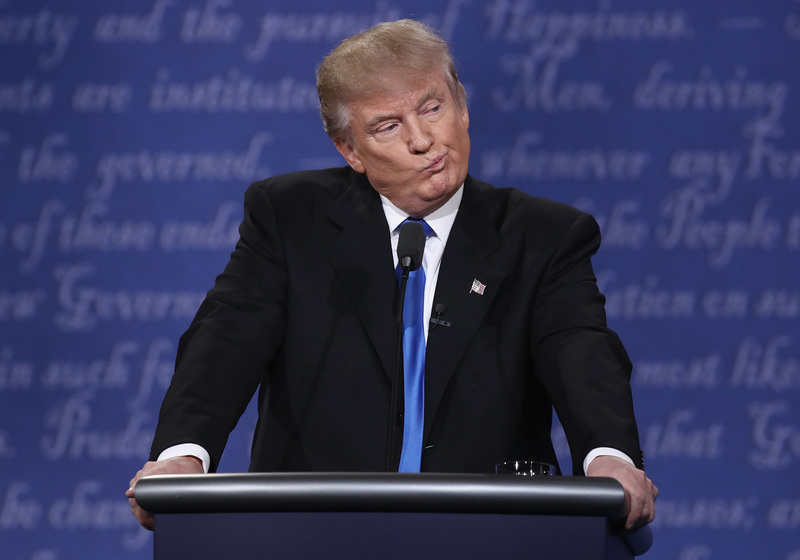 Vox reported that Trump interrupted Clinton 51 times throughout the debate, 25 of those interruptions coming in the first 26 minutes. This debate was always going to be observed through a different lens because of the inescapable gender narrative. Put a man who has made misogynistic and crass comments about women for decades on stage next to a woman who has championed equality and women’s rights her whole career, and it’s obvious the sparks will fly. But why didn't Clinton interrupt back? Didn’t she let down young girls everywhere by not showing them how to stand up to domineering men? Hardly. Clinton knew that letting him speak would do more damage than any disparaging remarks she could make.